London’s Heathrow Airport has seen dramatic changes since it opened in 1946, from canvas tents as terminal buildings serving converted military piston-engined airliners to the latest Airbus and Boeing jet airliners operating from five modern sophisticated terminals. As air travel became more affordable, Heathrow has expanded to accommodate the increase in airline traffic. 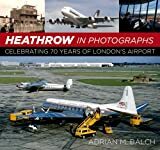 This pictorial timeline records these changes in air transport and infrastructure to capture the interest of the aviation enthusiast, the Heathrow visitor, or just someone who is fascinated by nostalgia in an ever-changing world. Adrian Balch is a long-standing aviation photographer, journalist, and author, contributing articles and photographs since the mid-1960s. He is passionate about quality aviation photography and has amassed a huge archive of color slides. He has published ten aviation books. Adrian served in the Royal Air Force in Air Traffic Control during 1971-93 and travelled extensively, never without his cameras, gathering material for his archive library.